Use natural elements such as rocks, tree stumps, logs, and branches in your landscape decor to add interest. If you gather these items yourself you can have a great looking garden landscape without spending alot of money. I happen to love the natural look in my landscape so the style is perfect for me. It is casual and easy maintenance too. That is an added bonus! 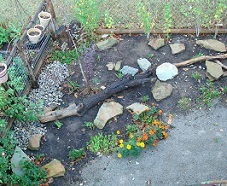 The photo above shows 3 tree stumps that were placed in our front yard landscaping last year year. They are still there witht the same pots and new flowers this year. They are out next to the street! You should see them decorated for Halloween. Or just imagine them with 3 faces from the Forest faces tree people featured in Our Landscape Decor Store- what fun, and such an interesting conversation starter too! the link is above, click on any item to enter the store. We added large all thread rod to the bottoms of the stumps so they won't get knocked over. That was an added security detail because they are so close to the street. The stumps are heavy enough that they would probably be fine without it. 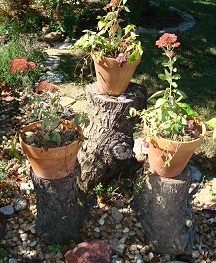 I have placed 3 terra cotta pots on the stumps. They have been there since spring. I planted small divisions from perennial flowers in the pots. This landscape decor idea is easy to do and inexpensive to get. Actually if you have the hardware to mount the stumps already available you can get this look for free. I found the stumps on the curb...someone had thrown them away. I brought them home, knowing that somehow they would take center stage in my landscaping. And they sure did. They are placed up front in my landscape. This part of my front yard landscape is to the right of my front arbor which is the entry to my walk. Look at the next photo, during warm months when the flowers are blooming and green you can barely see the big log that is placed in this flower garden. But during the winter months this log is the focal point of the garden. This flower garden is where a pine tree used to be in my front yard. I transplanted flowers from other areas in my landscape to create this free garden. 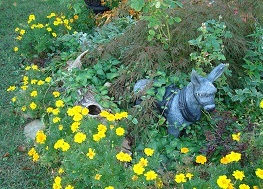 I added the Mule statue to the garden, because it represents my business name. Rented Mule. 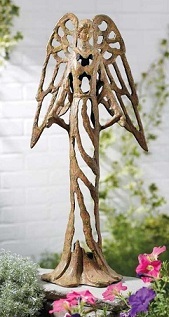 It is a interesting added landscape decor item during winter months too. The flower garden above is surrounded by a stone border all the way around it. Click on the link below to get more details about using stone borders in your landscape. There is a log about 8 feet long lying in the day lily garden. See photo here(right). When the day lilies are gone for the winter this log will get noticed. This garden is in our backyard next to our raised bed garden. The raised bed garden has posts from a barn used as fence posts. This all looks rustic and natural they blend perfectly together. The big log also helps to keep the dogs from digging in the new flower garden. So it is functional as well as decorative in the landscape. 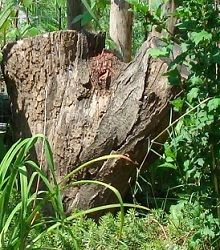 There is a big stump in the corner of the day lily garden too. See photo below. You can see some of the garden fence behind the stump. The following photos shows the day lily garden and side yard after we cleaned it up for fall. At this point the area was just dirt. We had day lilies and lots of maridolds and other annuals in the space all summer. If we left it as is, it would have become a very muddy area over the winter. We will be planting more perennials in the area next to the day lily garden, in the spring. After removing the annuals and trimming the day lilies back we had to make a decision on what type of mulch or stone to use as ground cover. The choices included mulch or stone. We decided to go with stone. It costs more than mulch in the beginning, but you don't have to keep replacing it each year. So, in the long run stone is less expensive. And with dogs it is a better value. We have stone next to our fence in our secret garden and it has remained in great shape for years. The first photo shows the space before we had it covered. There is just a little bit of the stone in place. 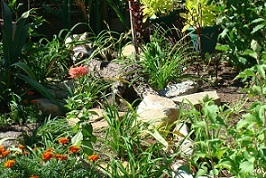 The next photos shows the day lily garden and part of the path. Both areas are freshly covered in new stone. 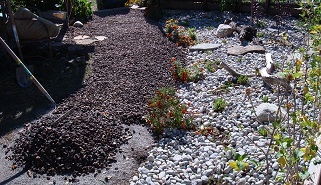 We chose river rock for the garden space and the pathway is being covered in ken lite. We discovered the ken lite stone when we bought our load of river rock. We used it in the pathway over the class I sand that had been down as a base for the pathway all summer. We purchased one cubic yard of both materials and hauled them in 2 trips on our utility trailer. The two different materials look good together. Both are natural stone. As this project is completed it is looking much better. We will probably us a larger stone border between the 2 materials if they start to blend together. That will be a spring project. Notice the tree branches and larger stones, they will look nice over the winter months as the flowers are dormant. Notice the green sedum ground cover in the white rock, it will become a rusty red color during cold months and really stand out again the stone. We transplanted this sedum ground cover from our former pond area. We had the same type of rock around the pond. . This photo shows the pathway after it was completely covered with stone. We will probably add a border to the edge in the spring. This small patio area was added at the beginning of the path. It makes the perfect place for placing a garden bench. And the dogs can no longer dig up the fresh dirt and sod. By now you may be wondering how did we get this stuff? And how did it happen to get used in as landscape decor? 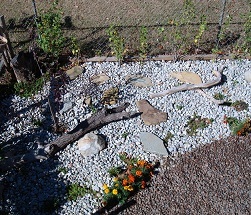 We have various rocks, logs, branches, and stumps though out our landscaping. We have gathered these items in a variety of ways over the past few years. My husband got it all started when he was on job sites as a project manager. During construction, rocks would get dug up. He would collect them and bring them home to use in backyard projects he was working on. This was before I knew him. When we got together I loved the look and we continued the theme even farther by adding the stumps and branches. We even added stone borders around alot of our landscape. We got our first branches and logs from a cedar tree that fell over during a wind storm at his dad's house. During the cleanup after the storm as they were cutting up the broken tree suddenly I thought, that is gorgeous! I need that for my landscape. That was the beginning of us collecting pieces of trees for our landscape decor. We filled the back of our SUV with branches and logs from the cedar tree. His dad even added some to his landscape too. The cedar will last for years. The other logs and stumps will last for a while(several years). We have also gathered tree branches and logs as we go camping, anywhere they are available. The look is great during winter months when all of plants are dormant. Plus the branches are supports for vines that grow in the flower gardens. We have also saved a few rocks that were dug up during projects in our yard. Like the one is this photo. 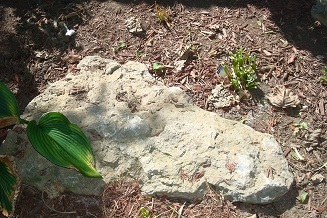 This big rock is placed in our hosta garden, which is in our secret garden. It earned a permanent home in our landscape after getting dug up from another part of our yard when we planted a plant. That rock was a tough one to get out, so we had to show it off in the hosta garden. When we refresh the mulch it will really show up good for winter. During winter when the hostas are gone the rocks in the hosta garden look nice. We also have several other types of stones in the landscape through out the yard. We use a mix of mulch and stone as ground cover. 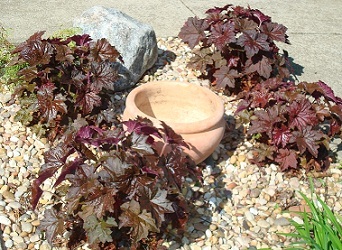 Dark colored foliage shows up better on light colored ground cover. Colors like purple get lost if planted in a mulched area. So when designing your gardens keep that in mind. For example- in our landscape on either side of our front walk, we planted burgundy corral bells in the stone covered area. Then mulched area has variegated liriope and other green plants. This photo shows the corral bells. 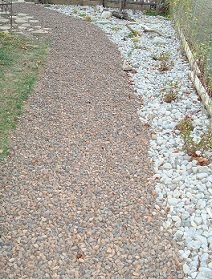 As you can see the pebbles used as ground cover are a good contrast. Mulch would blend to much with the color of the plants. Notice the rounded rock in the background. 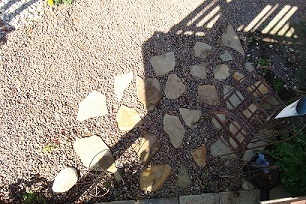 We have purchased the rock used at ground cover and some of the rounded stones. We have a few colorful stones mixed in that were purchased from the local landscape store that we shop at each year. Have A Great Story About using Stones, Tree stumps and Logs in your Landscape? Do you have a great story about this? Share it! Have you added natural elements such as stones and tree stumps or branches to add interest to your landscape? Tell us about it!